Order in next 14 hours and 17 minutes for despatch today. 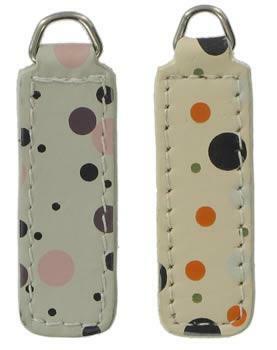 Polka Dot replacement zip tag for handbags. This leather replacement zip tag is covered in odd sized polka dots. It comes with a nickel split dee ring and is edged in the matching shade to the main part of the tag. The tag is available in 2 colourways; grey with pink and plum dots or cream with orange, brown, olive and duck egg blue dots. Make your choice of colour from the pull down menu below.